Shito-Ryu, along with Goju-Ryu, Wado-Ryu and Shotokan, is one of the four major systems of Japan (the Japanese islands excluding Okinawa). It was founded by Kenwa Mabuni (1887-1952), who, like most of karate's old masters, was descended from Okinawa's so-called warrior (bushi) class or aristocracy. Members of his family served Okinawan lords for hundreds of years. Mabuni started karate training at the age of 13 under Yasutsune (Anko) Itosu (1831-1915), the man who organized early karate in the Okinawan school system. Itosu was a student of one of Okinawa's most famous karate masters, Sokon Matsumura (1792-1887), the forefather of Shorin-Ryu. Itosu took a strong liking to his young pupil and Mabuni learned some 23 kata before the elder man died. 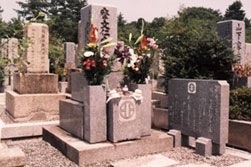 Itosu death so grieved Mabuni that he built a shrine in front of the masters grave and stayed close by for a year, practicing his kata daily. Itosu was not Mabuni's only teacher, however. While still in his teens, Mabuni was introduced by his friend, Chojun Miyagi (the founder of Goju-Ryu karate) to Kanryo Higaonna (1853-1916). 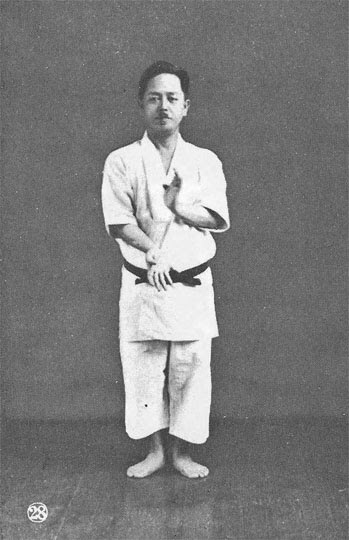 From Higaonna, Mabuni learned Naha-te, a Chinese-influenced karate style. Mabuni also trained under the reclusive Seisho Arakaki (1840-1918), who taught a style similar to Higaonna. Arakaki also taught Tsuyoshi Chitose, the founder of Chito-Ryu, Gichin Funakoshi of Shotokan, and Kanken Toyama of the Shudokan school. Arakaki, who was an acknowledged bo (staff) expert, taught Mabuni the unshu, sochin, niseishi, arakaki-sai and arakaki-bo forms. 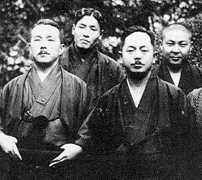 During the 1920s the insatiable Mabuni participated in a karate club operated by Miyagi and Choyu Motobu, with help from Chomo Hanashiro and Juhatsu Kiyoda. Choyu Motobu was a master of Shuri-te (the antecedent of Shorin-Ryu) and gotende, the secret grappling art of the Okinawan royal court. Hanashiro was also a Shuri-te expert, while Kiyoda came from the same Naha-te background as Miyagi. Known as the Ryukyu Tode Kenkyu-kai (Okinawa Karate Research Club), this dojo (training hall) was one of history's gems. Experts from diverse backgrounds trained and taught there, and it was there that Mabuni learned some Fukien white crane kung fu from the legendary Woo Yin Gue, a Chinese tea merchant living on Okinawa. By this time, Mabuni had become a highly respected police officer and made several trips to Japan after Funakoshi introduced karate there in 1922. Mabuni spent many of his early traveling years with Koyu Konishi, a friend and sometimes student who later founded Shindo-Jinen-Ryu karate. In 1925 Mabuni and Konishi visited Japan Wakayama prefecture where Kanbum Uechi, the founder of Uechi-Ryu, was teaching. It was after training with Uechi that Mabuni devised a kata called shinpa. But Mabuni actually spent most of his time in Osaka, where he taught at various dojo, including the Seishinkai, the school of Kosei Kuniba. Choki Motobu also taught at Kuniba dojo. It was Kuniba who later formed Motobu-ha (Motobu faction) Shito-Ryu. In 1929, Mabuni moved permanently to Osaka. Shortly thereafter, the Japanese martial arts sanctioning body, the Butokukai, pressured all karate schools to register by style name. At first, Mabuni called his style hanko-Ryu (half-hard style), but by the early 1930s Shito-Ryu was the official name. It was coined from alternative renderings of the names of Mabuni two foremost teachers, Itosu and Higaonna. Not everyone agreed with separating Okinawan karate into factions through the use of style names. In fact, shudokan headmaster Toyama questioned Mabuni and others about their use of what he called “funny-sounding names.” Mabuni countered that giving the style a name would not only satisfy the Butokukai, but would give people something they could identify with and feel a part of. Among Mabuni earliest students was Kanei Uechi (not to be confused with Kambum Uechi son of the same name), who by 1935 was also teaching in Osaka. In 1950, Uechi returned to Okinawa and established the Shito-Ryu Kempo Karate-do Kai. Kenzo Mabuni also acknowledged as the head of Shito-Ryu was asked by his mother Kame Mabuni to take over the style. Kenzo Mabuni was unsure and could not decide at the time what to do. So he went into seclusion in the city of Nagoya to train diligently and contemplate the great responsibility of carrying on the karate of his father. At the end of what became a two year retreat - most of it spent living in a utility-less dwelling, though he did spend some time training with Ryusho Sakagami and Ken ichi Watanabe, Kenzo Mabuni decided to accept this great responsibility and hence became the inheritor of his fathers lineage. Kenzo Mabuni lives in the original family home in Osaka, where he headquarters his organization the Nippon Karate-Do Kai.